2. With a variety of display modes, multi-angel and multi-lateral observation is possible. 3. Due to its large-capacity image playback and permanent image storage, doctors can easily get optimum images. 4. The usage of TGC adjustment mode and digital encoding regulator contribute to the high resolution of its images. 5. To better satisfy the requirements of image information transmission and external equipment, a large range of video output interfaces are equipped. 6. It also has features of digital beam synthesis, automatic probe identification, various image processing modes, automatic report generation, adjustable scanning angles and depth, puncture guiding function, and backlighting silica gel keyboard operation. 7. When equipped with 3.5 Hz convex array probe, it can be used in the diagnosis of abdomen and fetus. And when fitted with cavity probe, it is mainly used in the examination of gynaecology. 8. 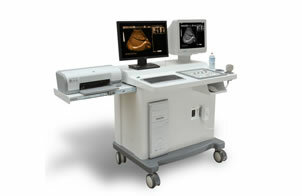 Its standard configurations are ultrasound scanner with 17" CRT monitor, image workstation with 19" LCD monitor, 3.5 MHz multi-frequency convex probe, and 6.5 MHz transvaginal probe. And its optional configurations include 7.5 MHz linear probe and HP ink jet printer. We are a professional manufacturer and supplier of digital luxury ultrasound scanner with image workstation in China. And we can also provide our clients around the world with many other products including veterinary ultrasound scanner, portable ultrasound scanner, laptop ultrasound scanner, etc. We have obtained ISO and CE certification, and we also offer OEM service. Our products have been well received by customers from many countries, such as Syria, Kazakhstan, Kyrgyzstan, India, Pakistan, Iran, Vietnam, Indonesia, Britain, Germany, Italy, Sweden, Romania, South Africa, Egypt, Ecuador, Uganda, Bolivia, Paraguay, Uruguay, Mexico, the United States, Canada, Argentina, Peru, and many other countries and districts. If you're interested in any of our products, please don't hesitate to contact us freely.